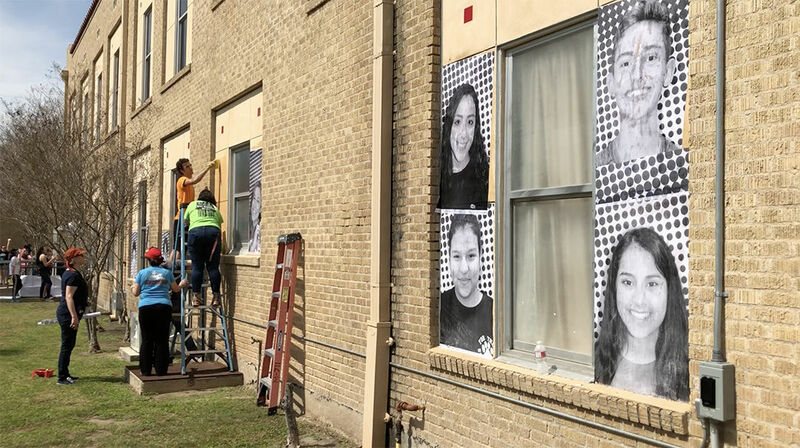 Lamar Academy students paste large portraits of their fellow classmates, teachers and school staff on the outside of the campus for all passers-by to see as part of the Inside Out project. McALLEN — Dozens of students spread throughout the outside of Lamar Academy on Saturday morning pasting 201 large portraits of their fellow classmates, teachers and school staff on the outside of the campus for all passers-by to see, all in the hope of sparking up conversations about what their school stands for. The initiative is part of the global art project, Inside Out, created by street artist JR who won a TED prize to develop the idea. Inside Out is known as The People’s Art Project and has gathered more than 260,000 participants throughout 129 countries. The project is intended to allow people to share their photo and make a statement of who they are and what they represent. In this case Lamar Academy was selected through Teach For America as one of the few schools in the Rio Grande Valley, as well as Raymondville High School, to participate. 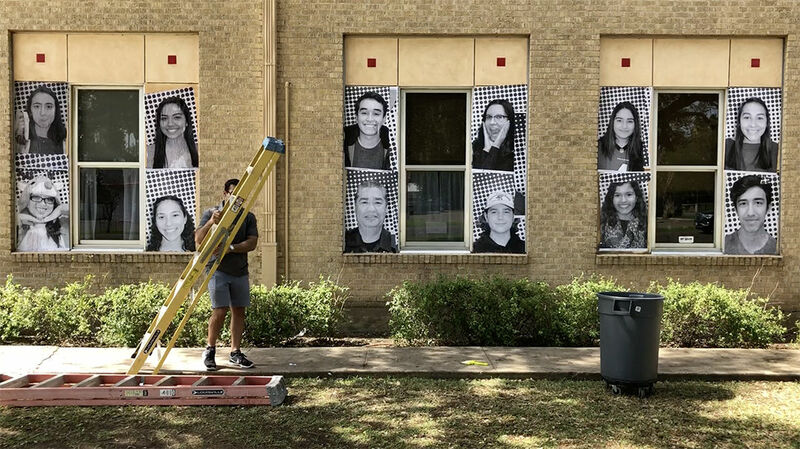 Lamar Academy's Shant Samtani helps paste large portraits of fellow classmates, teachers and school staff on the outside of the campus for all passers-by to see as part of the Inside Out project. Gutierrez is a McAllen native and TFA alumni, who decided to apply to participate, she said, with the intent to spark up conversations about what the academy is about, as people sometimes misconstrue the campus as it only being for a select amount of top students. The project at the academy is titled, We Choose Lamar, and Gutierrez said the intent is to depict the uniqueness of the campus that houses about 400 high school students from throughout the district who apply to be part of the only high school International Baccalaureate program — an international degree program intended to offer college-level rigor to high school students — or the Options program, which offers more of a one-on-one feel for students who want accelerated learning or those who are struggling with a traditional classroom setting. Gutierrez received notification of her pitch being selected last fall and they shot more than 200 pictures in December to send to Inside Out headquarters for printing. Earlier this year, they received the large prints all featuring the different personalities within the classrooms, including those of teachers and staff members who were also volunteering to put these up on Saturday. Jon Stevens, Teach for America managing director of Development, was also among the volunteers battling the wind to put up the portraits and said they were happy to facilitate access for area schools to become part of a global art project.